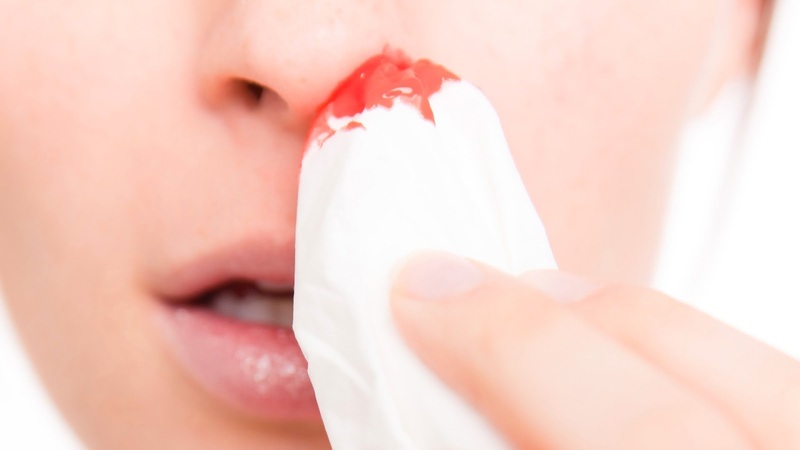 Consider these pointers for safely treating a nosebleed at home. Sit down and relax. Don't lean your head back — instead, lean forward. This will make your nose bleed less, positioning your head above the heart. If you lean back, this can cause your body to experience more issues, such as gagging, nausea and vomiting. Squeeze the softer parts of your nose together. Apply an ice pack or a bag of frozen vegetables on your nose and cheeks. But remember to wrap the cold compress in a towel. Read the labels on your medication, as some are known to thin the blood. Talk to your doctor if you're concerned. If you have children, maybe they tend to pick their noses. According to the article "Nosebleeds: What to do When Your Nose Bleeds" by FamilyDoctor.org, "Keep children's fingernails short to discourage nose picking." Keep the inside of your nose moist by turning on a humidifier at night in your bedroom. Smoking tends to irritate your nose, says FamilyDoctor.org, so really think about kicking the habit to the curb. Although nosebleeds can be treated at home, there are times where you will need to contact your doctor. For instance, if you feel like the bleeding is not stopping, you have the right to talk to a health care practitioner. Also, feelings of weakness can be treated by your doctor, as maybe you are feeling this way due to blood loss. Overall, take care of yourself when a nosebleed happens. Don't tilt your head back; lean your head forward and squeeze your nose together. And don't be afraid to ask a family member or roommate to help you apply an ice pack onto your nose or cheeks. Most of all, prevention matters — use a humidifier at night and talk to your doctor if you're using blood-thinning medication.